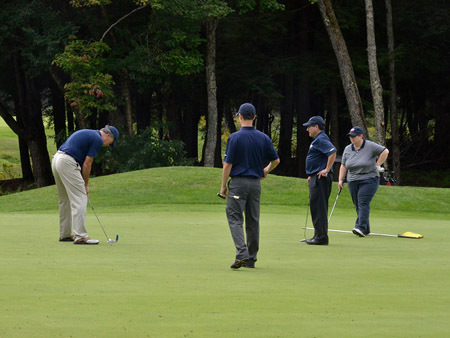 Mid Coast Hospital held its 25th Annual Golf Fore! Health Classic on September 12 at the Brunswick Golf Club. 133 golfers participated in this year's event, raising more than $49,000 to support health education programs offered by Mid Coast Hospital's Center for Community Health and Wellness. Since the tournament was started, more than $1 million has been raised to support the Mid Coast Center for Community Health and Wellness. 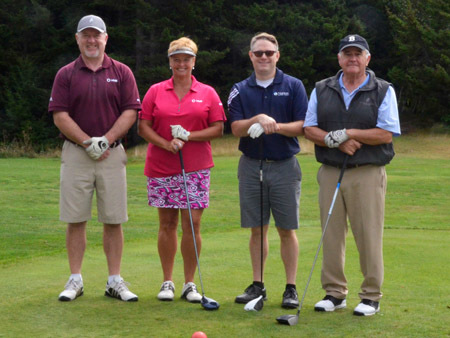 The Norton/HUB International New England, LLC, team enjoys Mid Coast Hospital’s 25th Annual Golf Fore! Health Classic. "We receive so much support each year from this tournament and we use all of the proceeds to keep people healthy and prevent disease from starting in the first place," said Lois Skillings, President and CEO of Mid Coast–Parkview Health as she addressed participants. "This year, we are excited about our recent reopening of the Parkview Campus which features an eight-provider primary care practice, a comprehensive cancer center, and the new Mid Coast Center for Community Health & Wellness, which is the hospital's hub for the programs and classes that this tournament helps to fund." The Mid Coast Center for Community Health and Wellness offers a variety of wellness programs, education, and resources. Programs offered by the Center focus on cardiac and pulmonary rehabilitation, medical exercise, weight loss, stress reduction, tobacco cessation, and healthy eating. New initiatives include medical exercise for Parkinson's Disease, cancer, and stroke patients. The Bernstein Shur team plays at the Mid Coast Hospital 25th Annual Golf Fore! Health Classic. "Each year, we look forward to seeing the many businesses and organizations that come out to support the health of the community," said Cate Parker, Director of Mid Coast Hospital's Center for Community Health and Wellness. "We are so grateful for the funds that we receive from this tournament which help us enhance the programs we offer in order to create healthier opportunities for our patients, visitors, and community members." This year's Tournament Sponsor was Bath Savings Institution. Exclusive sponsors included Guardian Pharmacy of Maine, Norton/HUB International New England, LLC, Mid Coast Hospital Auxiliary, and Johnson & Jordan. Platinum sponsors were Bernstein Shur, Bowdoin College, and Lincoln Financial Group. Other sponsors included Cammack Retirement Group, JHR Development of Maine, KeyBank, Norway Savings Bank, SMRT Architects and Engineers, Wright-Ryan Construction, WellTree, Proforma InMotion, The Times Record/The Coastal Journal, Springer's Jewelers, as well as the Hole-in-One Sponsors, Chad Little Outdoor Power Equipment and Goodwin Motor Group.